The Pacific was settled from the west by people sailing double-hulled canoes in a south-east direction. One of the main exceptions to this pattern was the settlement of New Zealand, which was achieved by sailing south-west from East Polynesia. To sail from East Polynesia to New Zealand, canoes must leave the tropical easterly trade winds, cross a zone of unpredictable winds, and then sail into a belt of strong westerly headwinds, in cold, rough seas. But often in late spring and summer high-pressure systems dominate latitudes north of New Zealand. As wind revolves counterclockwise around these high pressure systems, warm easterly winds along their northern edge provide an opportunity to sail westward easily. At this time of the year also, the tropical storms prevalent in summer are rare. The Micronesian islands, about 2,000 islands located in an area closer to Asia, were settled much earlier. 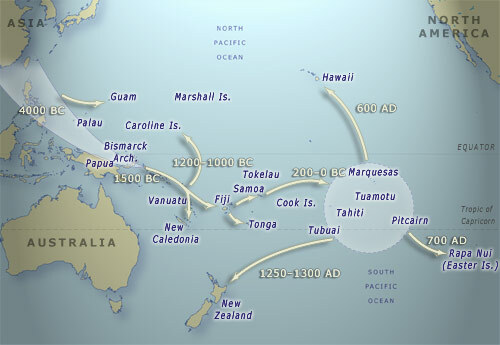 The Chamorro people settled the Mariana Islands in Micronesia some 4,000 years ago. They are believed to have sailed some 1,300 miles to the Marianas in the first major, open-sea migration in the history of mankind.